"Bidding farewell to the Governor of the Madras Presidency, Ampthill, in Mangalore." 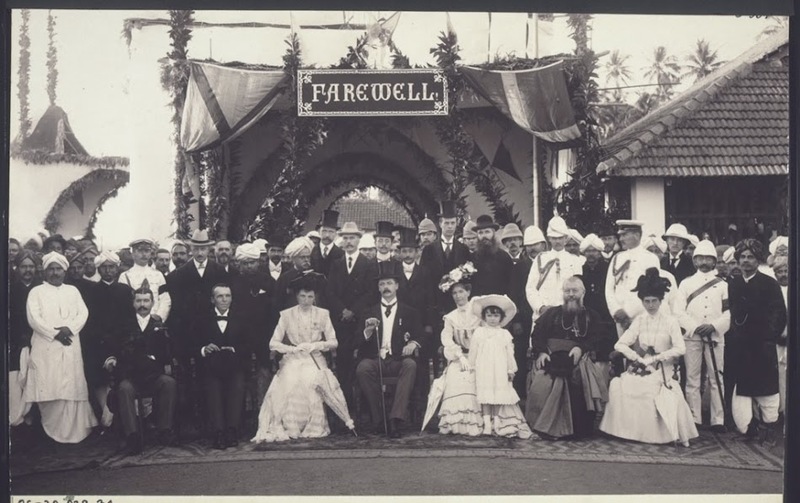 [English: Bidding farewell to the Governor of the Madras Presidency, Ampthill, in Mangalore.]" "[original caption] Abschied des Gouverneurs der Madraspräsidentschaft, Ampthill, in Mangalur." [Original text]: "1901 X. - Miss. Ritter, Huber, Stierlen, Altenmüller, Jesuit Mohr, Bankdirektor, Arzt. - Ingenieur, Collector, Richter, Frau des Gov., Gouverneur, Frau des Coll., kath. Bischof Dr. Cavatini, Begleiterin der Frau G., Schiwa Rao (ein Reicher)." Title: "Bidding farewell to the Governor of the Madras Presidency, Ampthill, in Mangalore." Breidenbach, Martin (Mr) , “Bidding farewell to the Governor of the Madras Presidency, Ampthill, in Mangalore.,” BMArchives, accessed April 19, 2019, http://www.bmarchives.org/items/show/67639.